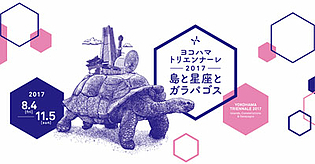 Über seine große Installation aus 1600 verwobenen indonesischen Bambusstäben auf der Yokohama Triennale 2017. 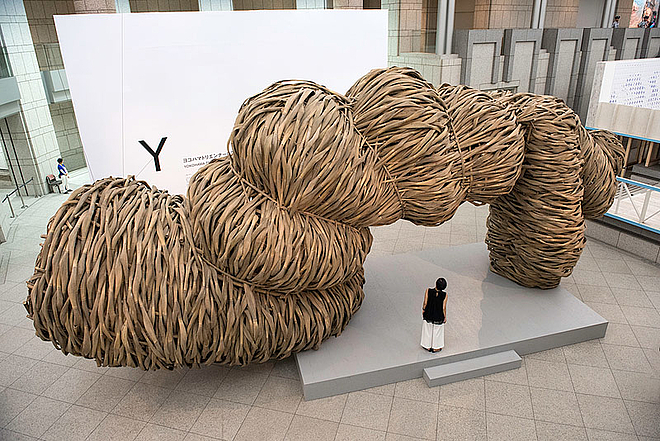 Joko Avianto's work, The border between good and evil is terribly frizzy, takes its title from Czech novelist Milan Kundera’s quote, “The border between good and evil is terribly fuzzy,” replacing the word “fuzzy” with “frizzy” to describe the curly shape of his sculpture for the Yokohama Triennale 2017, made out of 1,600 pieces of Indonesian bamboo. 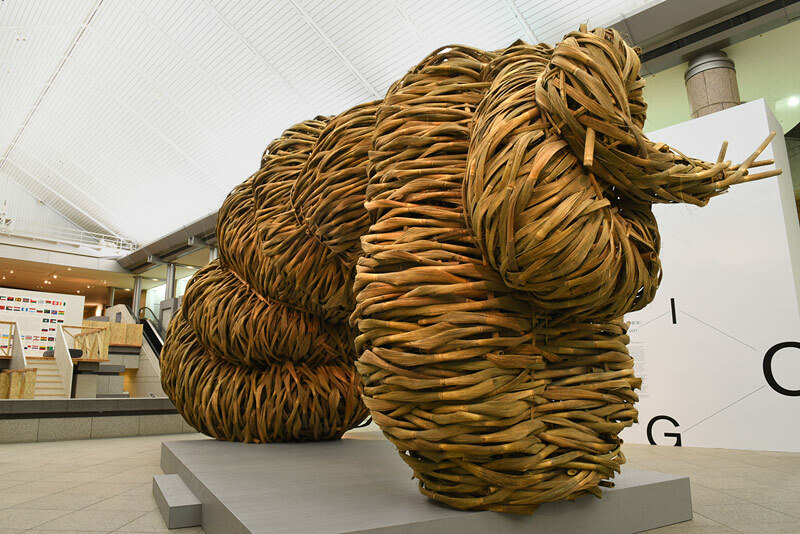 Avianto (* 1976 Cimahi Indonesia) had previously exhibited monumental works using weaved bamboos, as in his work pohon besar (big trees) presented in 2015 during the “‘roots. 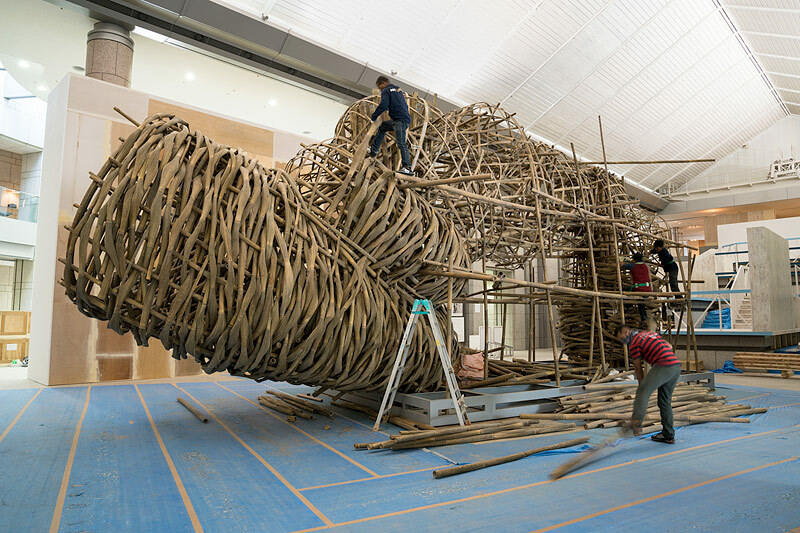 indonesian contemporary art” exhibition at the Frankfurter Kunstverein, wrapping the museum façade with weaved bamboos. 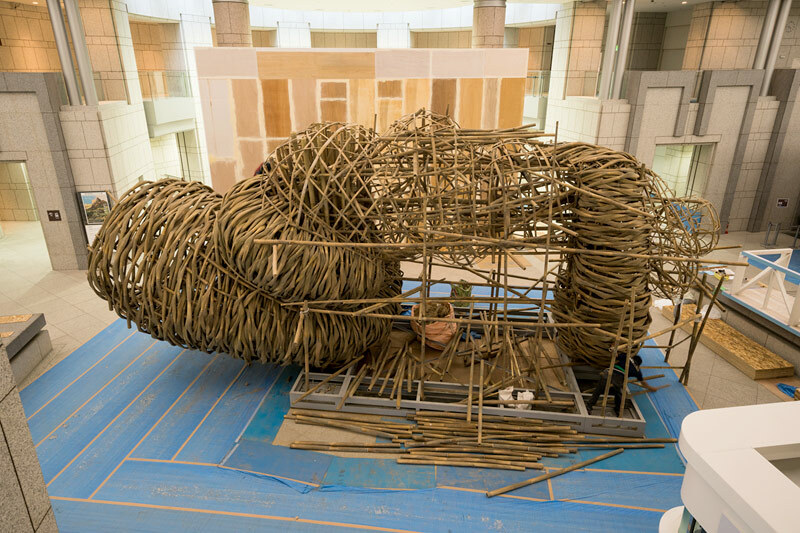 For the Yokohama Triennale 2017 “Islands, Constellations & Galapagos,” which is his first time showing in Japan, he responds to the Triennale’s key themes, “connectivity” and “isolation,” by making visual and symbolic connections between his own works and the ancient Japanese braided rope called shimenawa, often strung across the Shinto shrine gateway (torii), demarcating the sacred and the profane, or the ideal and the secular. For Avianto, shimenawa is the same as the cloud surrounding Mount Semeru, the name of the highest mountain on the island of Java taken after Sumeru, the central world-mountain in Buddhist cosmology. The cloud symbolizes the border between the earth and heaven, much like for what shimenawa stands. 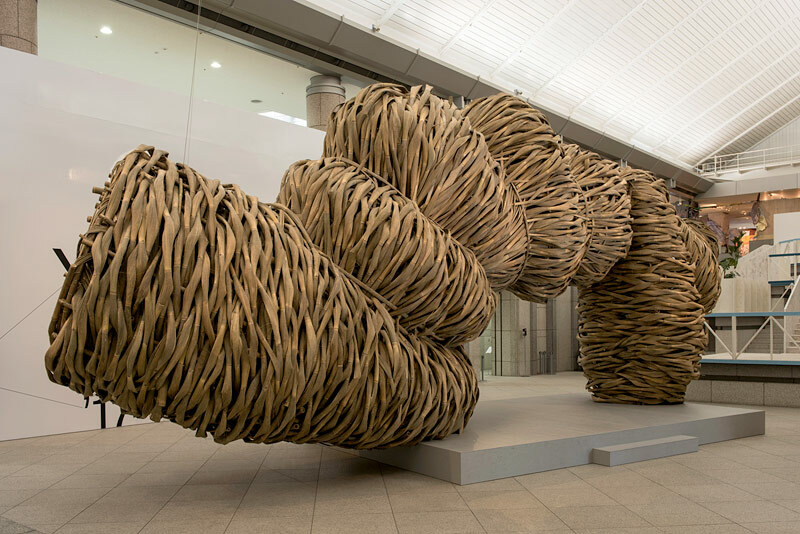 He decided to create a shimenawa-like gate at the entrance hall of Yokohama Museum of Art spanning 13 meters wide to set up a border towering over the visitors at the entrance of the museum. As the visitors enter the museum, Avianto’s work beckons visitors to trespass the border, and move from here to there, literally connecting the two opposing worlds. 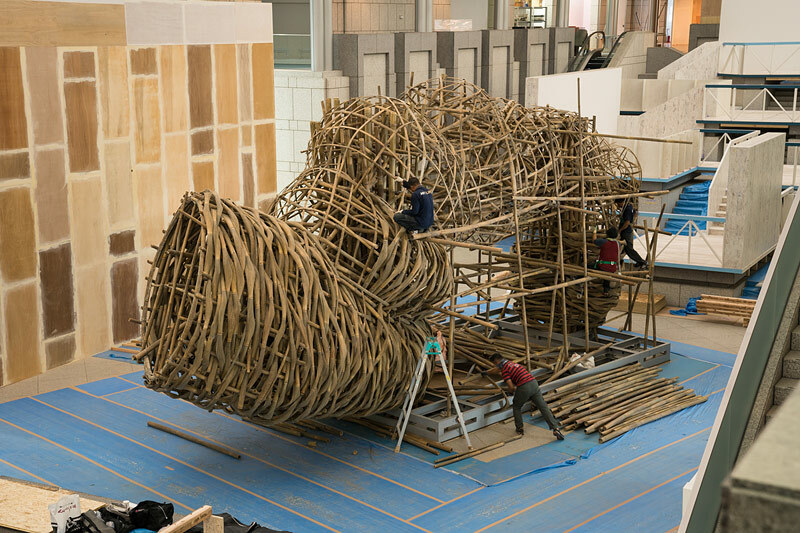 Dynamic in its scale, the frizzy shape was constructed onsite with a team of the artist’s workers who braided the two types of bamboos brought from West Java, building the base first and then slicing and weaving the bamboos in layers. Bamboo has long been popular in Indonesia as a material used for houses and daily necessities due to its suppleness, rigidity, and durability. Trained in sculpture, Avianto has studied how stone, bronze, and metal are commonly used for monumental works in public spaces. Instead of such heavyweight material, Avianto uses bamboo, originally more common in crafts, transforming them into a fine art material and elevating the everyday into a sublime experience, full of awe but notwithstanding humor in its form. Avianto, who was a university student in Bandung when his country underwent the fall of Suharto and then Reformasi, knows the power of political slogan. For him, using bamboo “when milk was considered a white gold and coal a black gold,” in the Suharto years, was a way to advocate “green is gold, too.” Avianto explores what his native country once was and has become, and how he could engage and intervene in the public space. * 1976 Cimahi, Indonesien. Lebt in Bandung, Indonesien.